Now when you're going to a ground of a team who play with good home form, you've just sold your only left back to Watford and you're hearing rumours on the coach that your main striker and best goalkeeper are out injured, it doesn't exactly fill you with confidence. All the news started filtering through as we entered Cheltenham and it took many people's attention away from what appeared to be a very nice town. However, getting to the ground, you could see how bad it was without even getting off the coach, you could see over the away end and into the ground, how's that for small. A quick march down a small road took us to the turnstiles and we were cast into a run down bus stop. 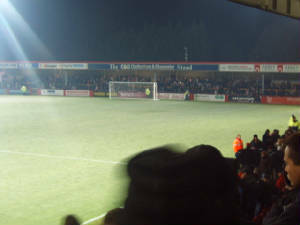 To our left, we had an extremely small terrace with a very very low roof and to the right, a marginally larger open terrace and that comprised as the away end. There was no chance of getting a decent view unless you were stood right at the front of the stand or had gone into the seating section in a different stand. We quite literally had to rely on the reactions of Cheltenham fans to see if they'd scored a goal (unless it was high in the net obviously). Anyway, continuning on the ground sees us take an anti-clockwise direction and happen upon a seated stand, this however was quite tacky, it was a decent high but the set out of the lettering and it's thinness just made you want to get Lawrence Llewlynn Bowen in to see if he could sort of this mess for a budget of £500. 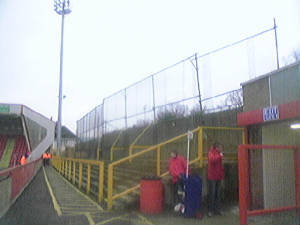 The stand behind the other goal was an average terrace with a low roof and nothing remarkable about the stand. 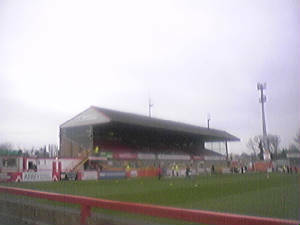 The final stand was an old grandstand with elevated seating and a standing area (not terracing) below it. 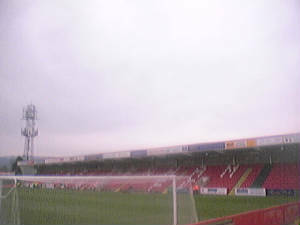 On the most recent visit to the ground, due to the redevelopment of this stadium, we were in a different section of the ground. This time, we were allocated seats in the stand to the right of where we normally were and I was actually quite impressed once inside. It had good facilities, PLENTY of leg room and offered a fantastic view of the action, the only real problem with it was that as at most grounds, you had about 7 or so little shits sat next to away fans who seem more intent on winding up the away fans than watching the match. The atmosphere isn't particully impressive and it is quite often a "sing when you're winning" mentality they have. Most of what little noise there is comes from behind the goal but the limited numbers of singers means that when they do manage to sing, you can't make out what they're saying. 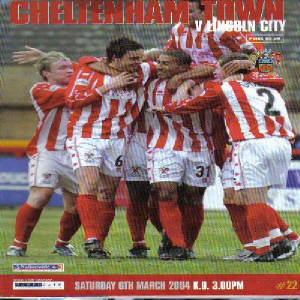 The programme was of an alright quality but couldn't make up the day. 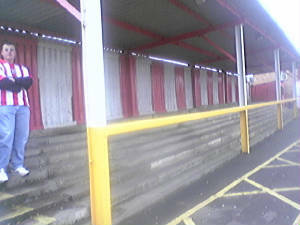 Overall, I have generally enjoyed my visits to Whaddon Road and am looking forward to going in their new away end when I get a decent chance to visit again. I would recommend this ground to anyone who wants to do a random game, seeing as the ground has a very high "football feeling" to it. However, if you're going in winter, wear a coat.